1 μg/ml for immuno blotting. Include the non-phosphorylated form of the peptide immunogen at 10 μg/ml to the diluted antibody. HEK293 cells transfected with HA-AS160A were stimulated as indicated. Crude lysates (60 μg) were probed for binding to the antibodies as indicated along the left hand side and visualised using secondary antibodies that were detected using the Odyssey Infrared Imaging System (LI-COR Inc.). The cells transfected with empty vector were serum starved before harvesting. 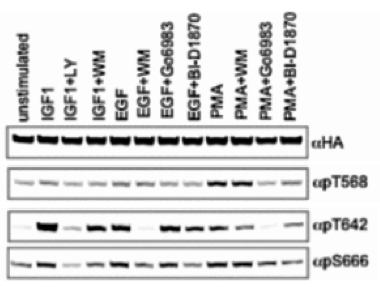 Regulation of multisite phosphorylation and 14-3-3 binding of AS160 in response to IGF-1, EGF, PMA and AICAR.